Mexican Fiesta Meatballs. Vibrantly colorful and boldly flavorful with a touch of kick…let’s get this party started! Another impromptu creation. I seriously had about 8 bell peppers stuffed in my two crisper drawers in the fridge screaming to be used. That’s what happens when I find a smoking deal on bell peppers – who can resist 2 for $1? Exactly. So you get 8. But I hadn’t had a chance to use them yet and they were ripe for using. So I pulled them out of the crispers, stacked them on the kitchen counter, stepped back and took a look…went to the fridge, opened the door, looked inside…of the various items in the fridge,the first one that stood out to me was a package of ground chicken. 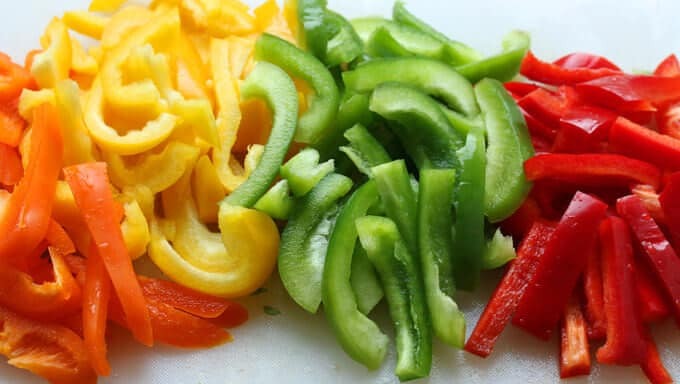 Bell peppers, ground chicken…what would you do with them? Well the idea that came to my mind was Mexican inspired meatballs and everything fell into place from there. It’s always fun creating recipes on a whim based strictly on what you have on hand. It’s also a smart way to save money. Think about it. How often do you go to the grocery store to get more food when you already have a ton at home that you haven’t used yet? I periodically make an inventory of what I have on hand and try to meal plan incorporating those items before I go out and buy more. It’s a fun way to challenge your cooking skills and broaden your culinary imagination. And it’s just plain good household organization sense. For this recipe I used Isernio’s Premium All-Natural Extra Lean Ground Chicken. I was introduced to the brand a couple of weeks ago at the International Food Blogger’s Conference (IFBC) in Seattle. There were a great number of brands represented at the conference and I was happy to see some local ones, including Isernio’s. Based out of Kent, less than an hour away from me, I wanted to give their products a try. So I picked up one of their bulk chicken sausage rolls (I just happened to notice they’re currently offering a $1 off printable coupon on their website for anyone interested) along with a shrink-wrapped package of fresh ground chicken breast. The ground chicken ended up being the perfect medium for today’s creation: Fiesta Meatballs. 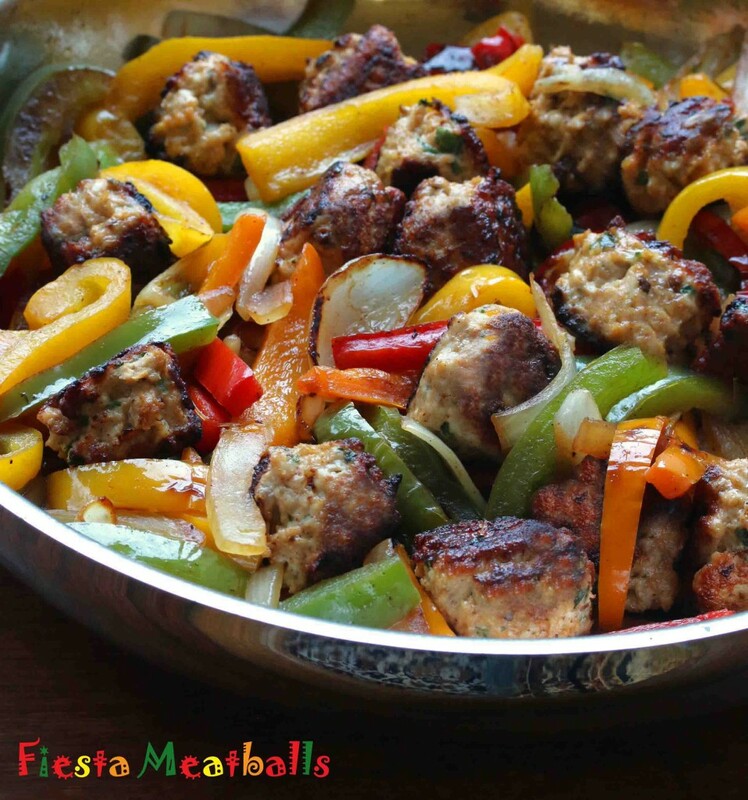 These Mexican Fiesta Meatballs are packed full of flavor! They’re served with some simple sauteed bell peppers and onions that complement, rather than dominate, the flavor of the meatballs. On it’s own, it’s a low fat, low calorie, low carb meal that will leave your taste buds and tummy very satisfied. You can also serve it with seasoned rice for a nice accompaniment to balance out the meal. 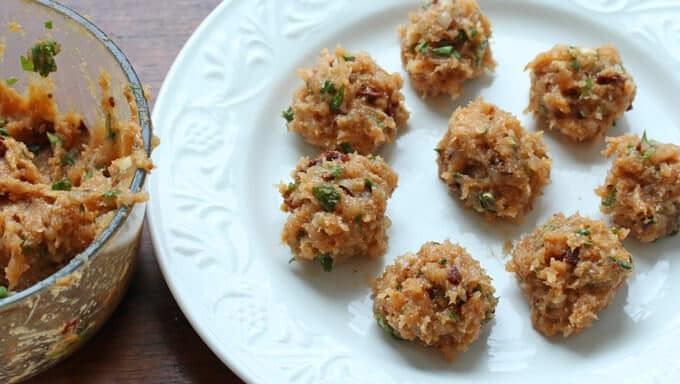 And I can just see the question at the tip of your tongue and the answer is “yes”: You can serve mini meatball versions on toothpicks with some salsa as dipping sauce for hors d’oeuvres. You’re welcome. 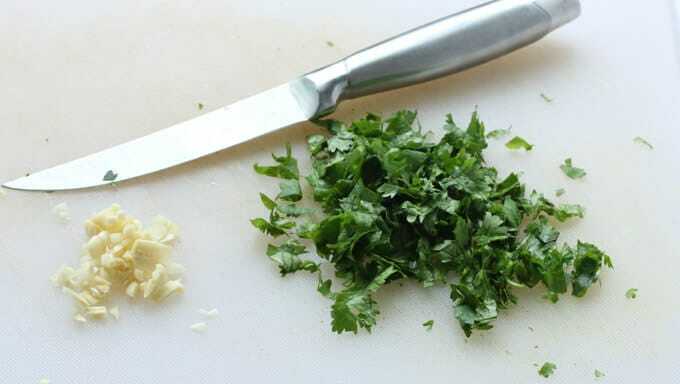 Mince the garlic and chop the cilantro. Chop the chipotles. 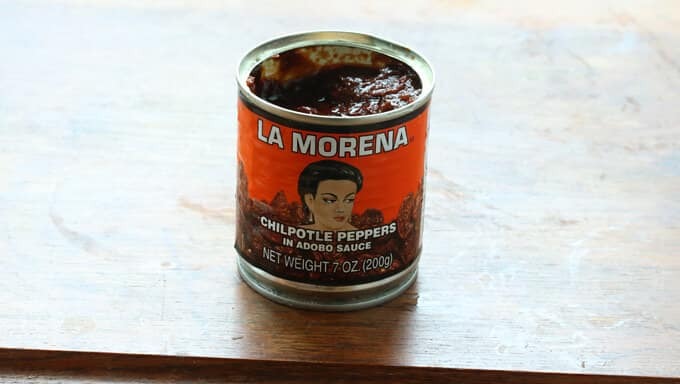 There are a number of brands of chipotles en adobo sauce and all taste a little different with different ingredient ratios. I like La Morena and pick them up from my local Mexican grocery store. You can also purchase it online HERE. Place the garlic, cilantro and chopped chipotles in a medium bowl along with the ground chicken, egg, breadcrumbs and spices. Use your hands to thoroughly combine the mixture. The mixture will be very soft. Wet your hands before forming the mixture into 1-inch balls. Set aside. Slice the bells peppers and onions. Just look at that gorgeous array of colorful veggies! 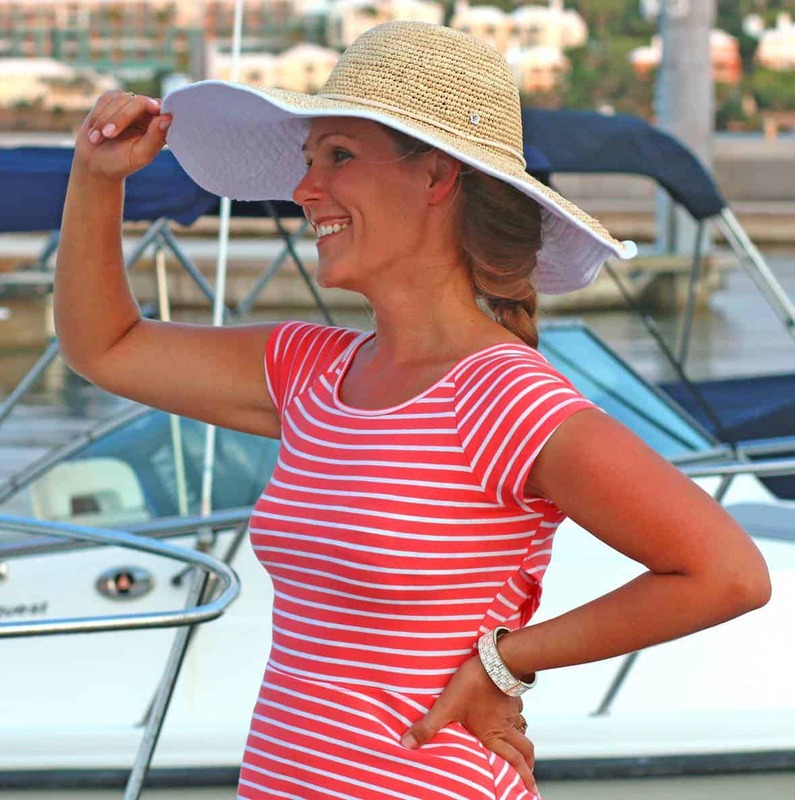 That’s right – FIESTA! 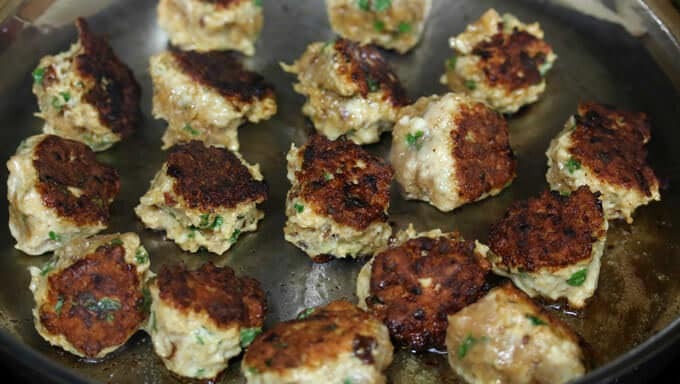 Heat the oil in a frying pan over medium-high heat and fry the meatballs in batches until generously browned on all sides. 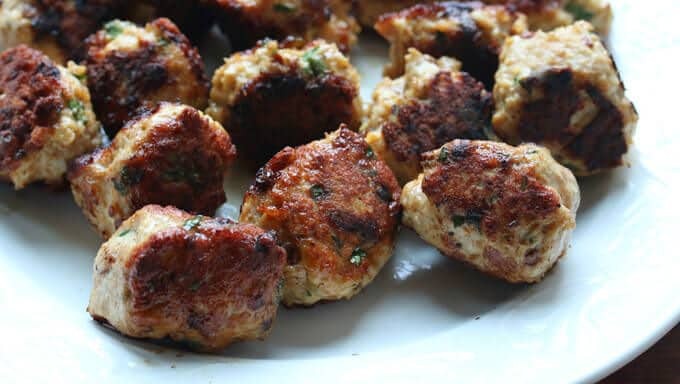 You simply must try these meatballs, they’re SO good! 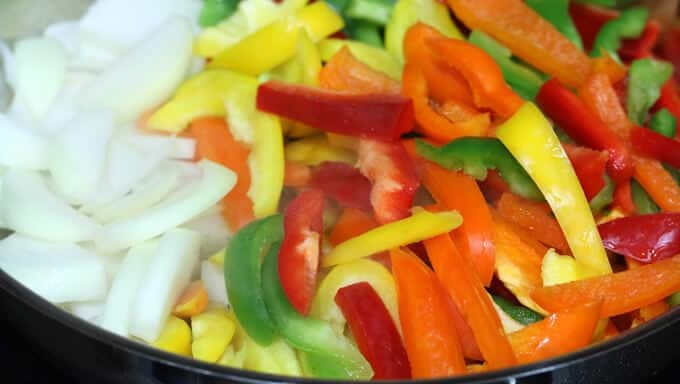 Add some extra virgin olive oil to the same frying pan and add the veggies. Add some salt and freshly ground black pepper and cook until softened, about 5 minutes. Return the meatballs to the skillet, stir to combine, cover the pan and simmer for another 3-4 minutes. Serve with a salad for a low carb meal or include a serving of seasoned rice. 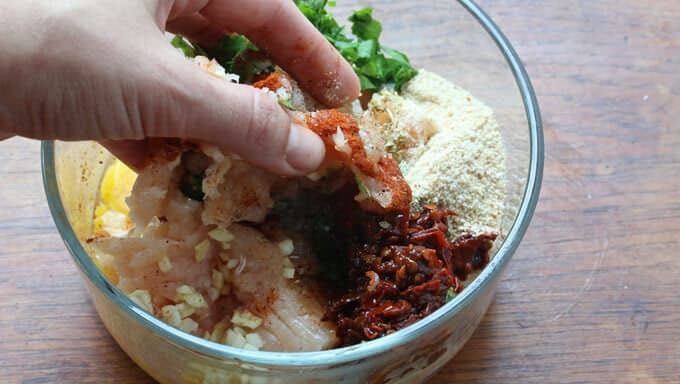 Combine the chicken, egg, breadcrumbs, chipotles, cilantro, salt, pepper, oregano and chili powder in a large bowl and mix with hands until thoroughly combined. Wet your hands and form the mixture into 1-inch meatballs. Heat the oil in a large skillet over medium high heat. Once hot, add the meatballs and fry until browned on all sides. Transfer to a plate. 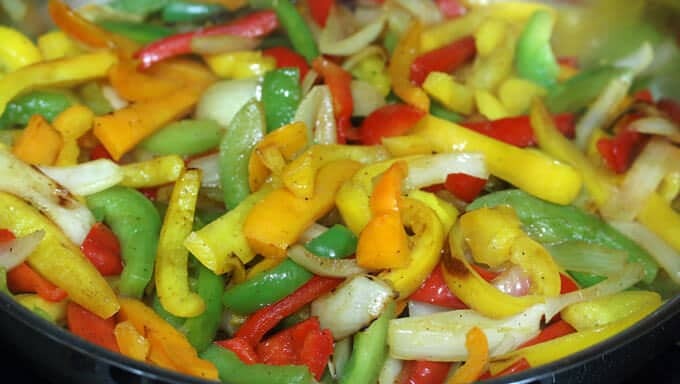 Add the peppers and onion and to the skillet along with another tablespoon of olive oil and fry until softened, 5 minutes. If you want a little more heat, add 2 teaspoons of adobo sauce from the can. Add salt and pepper to taste. Return the meatballs to the skillet, stir to combine, cover, and cook for another 5-8 minutes until the meatballs are cooked through. Mmmmm, these look and sound so good! Love the flavors in the meatballs. I like the flavor of pork in meatballs but I also like the option of lean chicken for a low-fat meal. 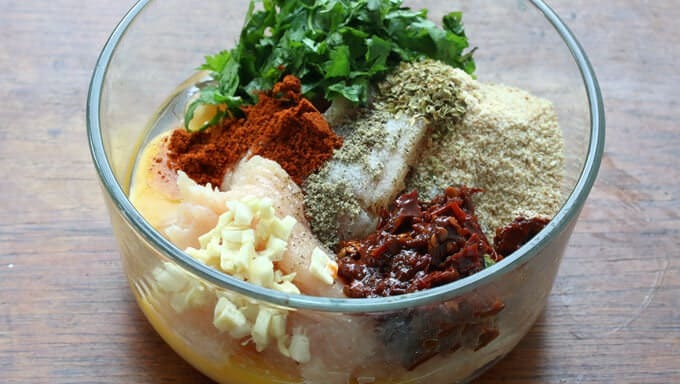 Can’t wait to try this, will be making it soon, thanks! Thanks, Cathy! Exactly, the pork will have more flavor, but the chicken is obviously much leaner and tastes fantastic, too! Enjoy! This is so colorful, love it! I don’t think I’ve ever purchased chipotles before but I love the flavor every time I’ve had Mexican dishes with chipotles in it. Will check in the grocery store first and if I can’t find it there will get it online (thanks for the link). Thanks, Cori! Once you get the chipotles and make this dish you’ll have some leftover – check out my other Mexican recipes (menu bar under dishes by region) and you’ll find several using chipotles. You’ll love ’em! Have fun with this and enjoy! Hi, quick question: are you using dried or fresh breadcrumbs in this recipe? I have a hunch the outcome would be different using dried verses fresh. Thanks. I have an abundance of peppers still on the bush in my garden and I think this recipe is in my future. Hi Gail, I used dried this time but you can use either. Since chicken tends to be a bit drier than pork or beef, fresh breadcrumbs may be an even better option if you have them. I envy your abundance of garden peppers :) Enjoy! I’ve enjoyed reading your posts and recipes and look forward to pics of Inn at the Market. I made 2 of your recipes this weekend. Yesterday I made the Chocolate Butterscotch Pumpkin Streusel. Couple questions: I found the 1/4 cup butter and 1 cup brown sugar never became fluffy from beating. So I added more butter. Was the okay or did I alter the cake? Also, I couldn’t find pumpkin puree so I bought organic pumpkin at Trader Joe’s. Then…I only had an 8 X 8 baker so I used it. I baked it way over 40 minutes. Suggestions? I just made the fiesta meatballs for tonight’s dinner. Certainly looks yummy & healthy. Which I like. Can I store the chipotles in frig or freeze? Hi Sandi, thanks so much :) You’re right, “fluffy” may not be the best word. And adding more butter wouldn’t have harmed it. The pumpkin you used is the same thing. Some cans say “puree” others don’t. The main thing is that it’s 100% pumpkin, not pumpkin pie filling. 8×8 is fine, too, it just means a thicker cake which yes, will require a little longer baking. How did it turn out? The leftover chipotles can be stored in the fridge for several days or frozen for much longer. You can freeze them in a small airtight container or ziplock bag. If you type “chipotles” in the search box at the top right corner of my blog you’ll find several other recipes using chipotles that you may like. Great way to use up those leftover chipotles! *Sandi, I just looked at that recipe again and realized that it was supposed to say 8×8 inch baking pan. Sorry for the confusion. 9×9 would be fine too, just a bit thinner cake. I updated the instructions though. Hi again, Kimberly. The cake turned out dense. After talking with colleagues at work, I think that my baking soda and/or powder need to be replaced. So I’ll do both. And try it again. I have to tell you though…that our dog loved it! We have a Standard Poodle and he “counter surfs” at times. The cake was pushed way back to the wall, but when I came home, he’d found a way to pull it closer and ate a considerable amount!!! HA! Well, I don’t know that I would normally be flattered by a dog’s compliment, but in this case I’ll take it! :) I’m sorry this cake didn’t turn out as you expected. As a coffee/streusel cake it is meant to be fairly dense, it’s not a light and delicate cake. So your baking soda or powder may not be to blame. To the extent that it was denser or drier than it’s meant to be, the more likely culprit was the over-baking. The toothpick test is always the best gauge – when inserted into the center of the cake it should come out moist but not coated in batter. Kimberly! This proved to be an amazing, deeply flavorful meal. It certainly transforms ground chicken into something delectable. The tastes are still in the back of my throat after almost three hours later, and they are welcome, as are the lingering aromas coming from my kitchen. I made some seasoned rice for a side. Really great and memorable spices. PS: I am going to make your recipe for Tomatensalat for my German best friend with whom I’ll be working at my house on Friday. Is the recipe pretty much authentic? It seems so but I just thought I should ask. Hi Valerie, that’s wonderful, so glad to hear it and I really appreciate the feedback, thank you! Yes, this Tomatensalat recipe is what you’ll find in many areas of Germany, both in German homes and in restaurants. Enjoy!